Hello. 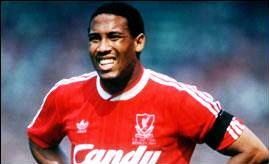 My name's John Barnes. I used to play for Liverpool and my blinding skills and exciting plays have inspired the creators of this site to give me my own section, John Barnes Corner. All the different things I, John Barnes, have put in this section are listed here. My personal favourite is the John Barnes Culinary Tips section, written by John Barnes (that's me). I advise you look at that one first. But I am biased. I'm also John Barnes. John Lukic’s sensational super shot stopping section. Hi, I’m John Barnes. In my time at Liverpool, I faced some of the best keepers in the world. I also faced John ‘Lucky Bounce’ Lukic. Here he gives us some indipensible goal saving tips.